Vaccine clinical trials are relatively short and narrowly focused. Researchers cannot find what they do not look for. Genetically modified antigens, potent adjuvants, animal and human cellular contamination and residue, and other ingredients are not evaluated for their complete impact on the immune system or developing neurological systems or organ health, and much more. These impacts are only learned after a vaccine is given to the general population. And only if someone spends the time and money paying attention and researching the findings. Aftermarket reporting is the fourth phase of product assessment–it is a phase that is, or rather should be–perpetually ongoing since environmental conditions and factors can change, altering a vaccine’s impact on individuals and public health. Currently, we lack a vigorous mandatory adverse reaction reporting system. Most side effects and unintended consequences are not revealed in a timely manner, if at all. And with the 1986 National Childhood Vaccine Injury Act removing product liability from vaccine makers and providers, the financial incentive to find side effects and unintended consequences is non-existent. Many chronic conditions today with environmental causes are being “normalized” rather than researched and their causes eliminated. The environmental causes are billion dollar industries. The drugs and therapies that address the symptoms are billion dollar industries. The incentive to find true causes may not exist with industry — but incentive overflows in the hearts of parents the world over. We at Informed Choice WA are parents, grandparents, doctors, lawyers, nurses, teachers, scientists — we are from all walks of life, and we share a common goal of restoring the health of children everywhere. We work toward scientific integrity in policymaking and the restoration of fully informed medical consent. We are building here a library of papers that reveal the unintended consequences of vaccination that must be addressed. More papers to be added soon. Institute of Medicine; Board on Population Health and Public Health Practice; Committee to Review Adverse Effects of Vaccines; Kathleen Stratton, Andrew Ford, Erin Rusch, and Ellen Wright Clayton, Editors. “Adverse Effects of Vaccines: Evidence and Causality.” Evidence and Causality | The National Academies Press, 25 Aug. 2011, www.nap.edu/catalog/13164/adverse-effects-of-vaccines-evidence-and-causality. Arumugham, Vinu. “Evidence that Food Proteins in Vaccines Cause the Development of Food Allergies and Its Implications for Vaccine Policy.” OMICS International, OMICS International, 10 Oct. 2015, www.omicsonline.org/open-access/evidence-that-food-proteins-in-vaccines-cause-the-development-of-foodallergies-and-its-implications-for-vaccine-policy-2329-6631-1000137.php?aid=60994. Please see our Aluminum Page for papers on the immunological and neurological impact of aluminum adjuvants. Wang, Hsiuying. “Anti-NMDA Receptor Encephalitis and Vaccination.” International Journal of Molecular Sciences, MDPI, Jan. 2017, www.ncbi.nlm.nih.gov/pmc/articles/PMC5297824/#!po=57.2917. Dalmau, Josep, et al. “Clinical experience and laboratory investigations in patients with anti-NMDAR encephalitis.” Lancet neurology, U.S. National Library of Medicine, Jan. 2011, www.ncbi.nlm.nih.gov/pmc/articles/PMC3158385/. Yang, San-Nan, et al. “The Effects of Environmental Toxins on Allergic Inflammation.” Https://Doi.org/10.4168/Aair.2014.6.6.478, synapse.koreamed.org/DOIx.php?id=10.4168%2Faair.2014.6.6.478. Handley, Jr. J.B. “Did British scientists just solve the autism puzzle?” Medium, Medium, 8 Dec. 2017, medium.com/@jbhandley/did-british-scientists-just-solve-the-autism-puzzle-5a7eacc77415. Richmand, B J. “Hypothesis: conjugate vaccines may predispose children to autism spectrum disorders.” Medical hypotheses., U.S. National Library of Medicine, Dec. 2011, www.ncbi.nlm.nih.gov/pubmed/21993250. Ruiz, J T, et al. “Adjuvants- and vaccines-Induced autoimmunity: animal models.” Immunologic research., U.S. National Library of Medicine, Feb. 2017, www.ncbi.nlm.nih.gov/pubmed/27417999. Goldman, G.S., and P.G. King. “Review of the United States universal varicella vaccination program: Herpes zoster incidence rates, cost-Effectiveness, and vaccine efficacy based primarily on the Antelope Valley Varicella Active Surveillance Project data.” Vaccine, Elsevier Science, 25 Mar. 2013, www.ncbi.nlm.nih.gov/pmc/articles/PMC3759842/. “Comparison of HPV prevalence between HPV-Vaccinated and non-Vaccinated young adult women (20–26 years).” Taylor & Francis, www.tandfonline.com/doi/abs/10.1080/21645515.2015.1066948. Fischer, Sonja, et al. “Shift in prevalence of HPV types in cervical cytology specimens in the era of HPV vaccination.” Oncology Letters, D.A. Spandidos, July 2016, www.ncbi.nlm.nih.gov/pmc/articles/PMC4907297/. Meeting of the Board of Scientific Counselors, Office of Infectious Diseases Centers for Disease Control and Prevention, Tom Harkins Global Communication Center, Atlanta, Georgia December 11-12, 2013. MINUTES. Vashisht, Neetu, et al. “Trends in Nonpolio Acute Flaccid Paralysis Incidence in India 2000 to 2013.” Pediatrics, American Academy of Pediatrics, 1 Feb. 2015, pediatrics.aappublications.org/content/135/Supplement_1/S16.2. Cowling, Benjamin J., et al. “Increased Risk of Noninfluenza Respiratory Virus Infections Associated With Receipt of Inactivated Influenza Vaccine.” Clinical Infectious Diseases: An Official Publication of the Infectious Diseases Society of America, Oxford University Press, 15 June 2012, www.ncbi.nlm.nih.gov/pmc/articles/PMC3404712/. “Wells Syndrome Secondary to Influenza Vaccination: A Case Report and Review of the Literature.” Taylor & Francis, www.tandfonline.com/doi/abs/10.1080/21645515.2017.1417714?journalCode=khvi20. 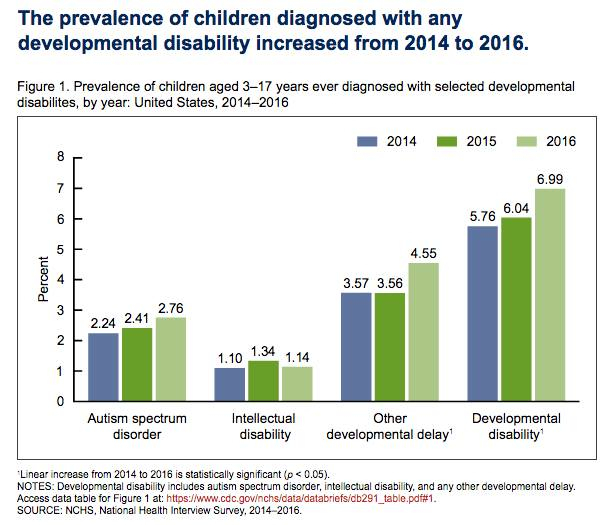 Rates of developmental disability continue to rise at epidemic rates.